CIBC donated a Dexcom Continuous Glucose Monitoring System to ACE Diabetes, a local diabetes association, through the Family Medicine Center, who selected Kaylee and her parents, Kareem and Shelisha Hanchell, to receive the system. Dr Cates and Nurse Specialist Practitioner Anita Cates, of the Family Medicine Center, have been guiding Kaylee and her parents through the process of managing her diabetes since she was diagnosed. 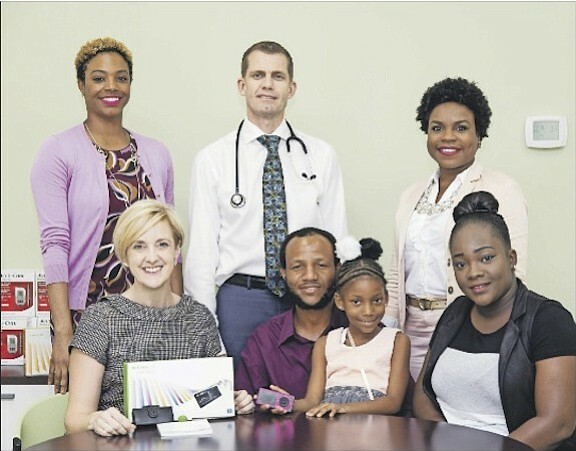 Caption: Nurse Specialist Practitioner Anita Cates, of Family Medicine Centre, (bottom left) presents the Hanchell family with a Dexcom Continuous Glucose Monitoring System and donated by CIBC FirstCaribbean International Bank and a two month supply of sensors donated by Atlantis Paradise Resort. Top, from left, are Marketing Manager for CIBC FirstCaribbean, Maya Nottage; Dr Graham Cates, of Family Medicine Center; and Associate Director of Special Events at Atlantis Paradise Resort, Anitha Bulter.